You may not notice the sound of your car’s engine when it’s running properly. However, you almost surely could identify a car without a functioning muffler. A car’s muffler soundproofs the pressure created by the engine. While you may not think a car’s exhaust system has anything in common with a finely-tuned musical instrument, the muffler is exactly that. It uses complex physics to cancel out the sound waves that make your car noisy. Listen –If it seems louder than normal, you may want to get your exhaust system checked. Feel – If your car idles more roughly than normal, your muffler or exhaust system may not be doing their jobs properly. Look – A muffler is usually located at the rear of your car and is visible if you look underneath. If you see any holes or leaks, it’s time to take it in. Mufflers may reduce engine power because the gas flow from the engine is obstructed to a degree. 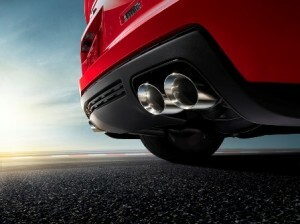 Therefore, some drivers trade in their manufacturer’s muffler for an after-market one designed to increase power.